Its December already and time to celebrate holiday season with baked goodies. 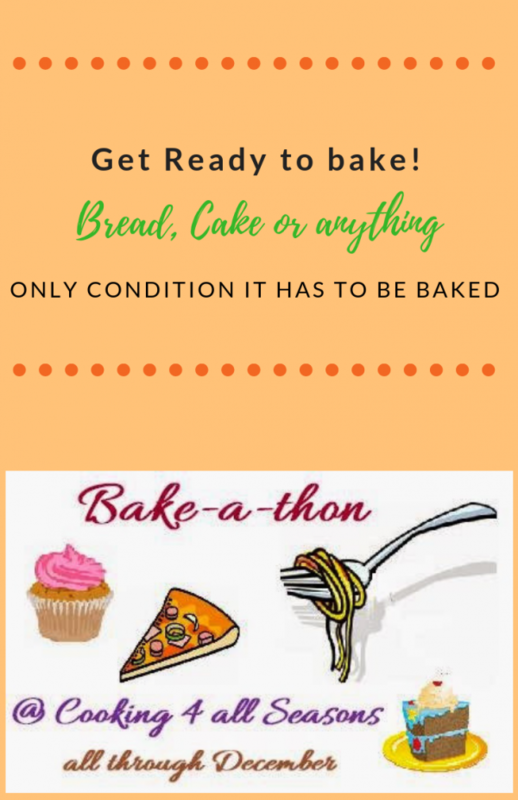 We group of bloggers participate in Bake- A- Thon and some of our blogger buddies are going to share baked goodies on Monday,Wednesday and Friday for the entire month of December. Today I start up the Bake-A-Thon with a simple eggless custard powder cake.The cake was in my to do list so long and finally tried it.The cake came out so good and delicious with a perfect texture.I halved the original measurement and made two inch bundt cakes as my lil one wanted cute cake. Take all purpose flour,baking powder,custard powder and salt and mix it well.Sieve it for couple of times.Grease the baking pan with baking spray or oil and dust some flour.Keep it aside and preheat the oven in 350 F.
Now in a bowl take the butter and sugar,whisk in a hand blender or whisker until it becomes creamy and smooth.Now to this mixture add in the 1/2 cup of milk.Add add 1/2 of the flour and mix it well. Then add the remaining portion of the flour and mix it well.Pour the batter into greased pan. Keep it in the preheated oven.Bake it for 30-35 minutes(mine took 34 minutes) or until a tooth pick comes out clean.Let it rest it for couple of minutes and invert the cake to a wire rack and allow it to cool completely. The sweetness was just perfect with the given measurement. Slice the cake once its completely cool down. Here I sprinkled the powdered sugar and did not use any vanilla extract as I used the vanilla custard powder. 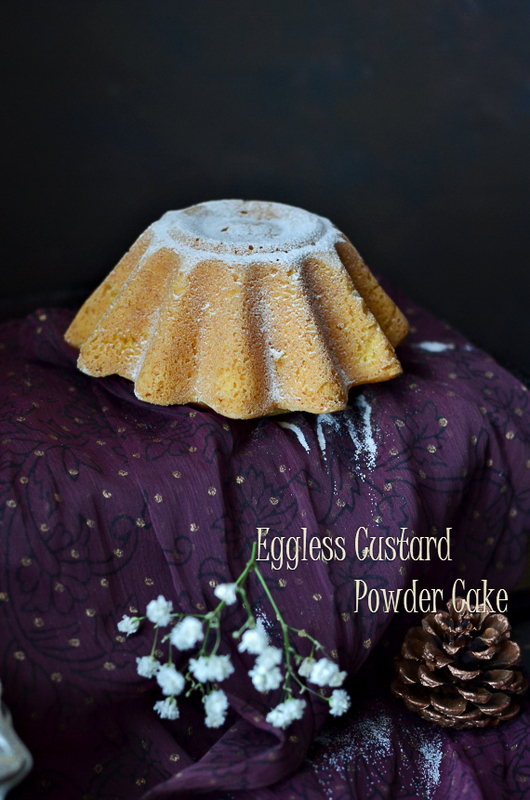 Eggless custard powder cake rocks, how spongy its looks. And am sure a slice of this cake with a cup of coffee or hot chocolate is quite enough to fill some hungry tummies around. Looks so light and spongy with the sweet flavor of custard powder. Very cute too. Wow! That is such a beautiful Bundt cake Nalini. Without eggs, the texture of the cake is just amazing. 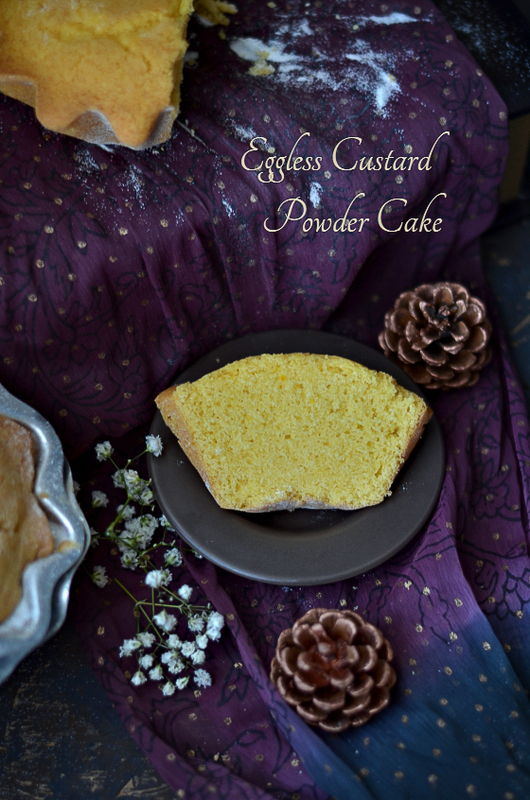 Perfectly baked custard powder cake Nalini. That mini bundt cake looks beautiful. Even without eggs, it looks so soft and fluffy. 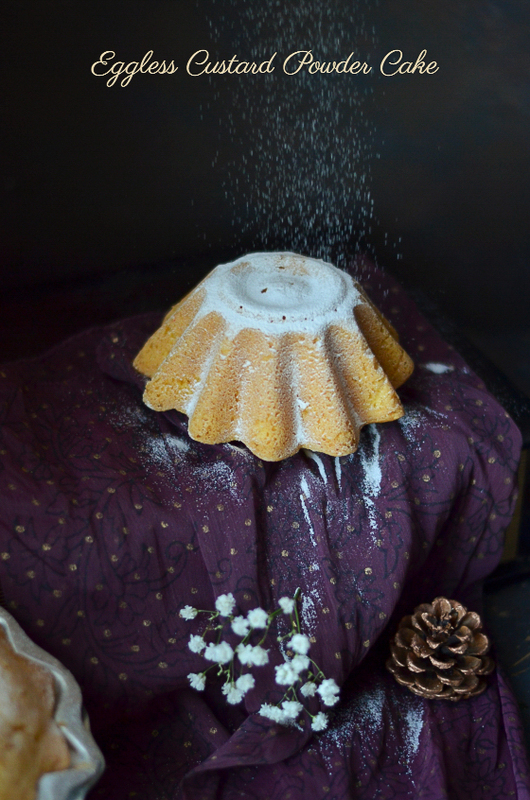 The custard cake looks stunning Nalini. I always love the fact that you bake most of your cakes eggless and all of them turn out great!..a wonderful start to the series. The cake has got a very light and spongy texture, just perfect to everyone's liking. Those mini bundt cake molds are cute. 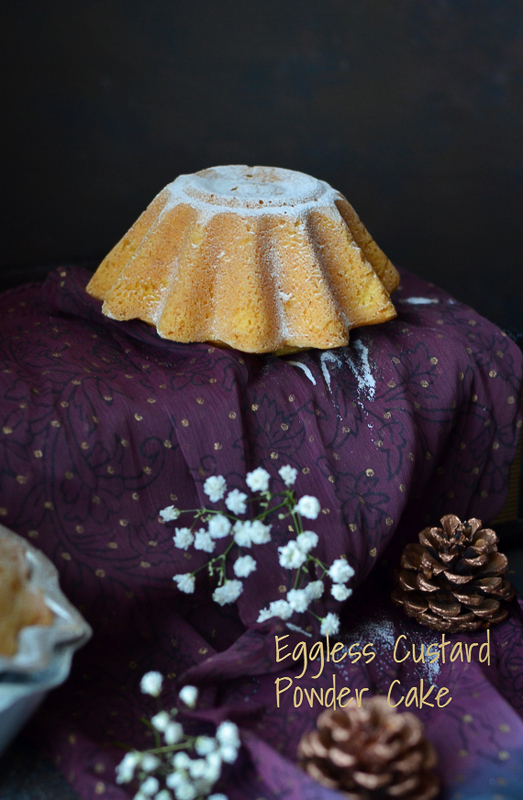 Such a beautifully textured custard cake and the pics really tempt me a lot!! This cake is really cute, and looks so soft and spongy. Custard powder must have given it a different flavour. 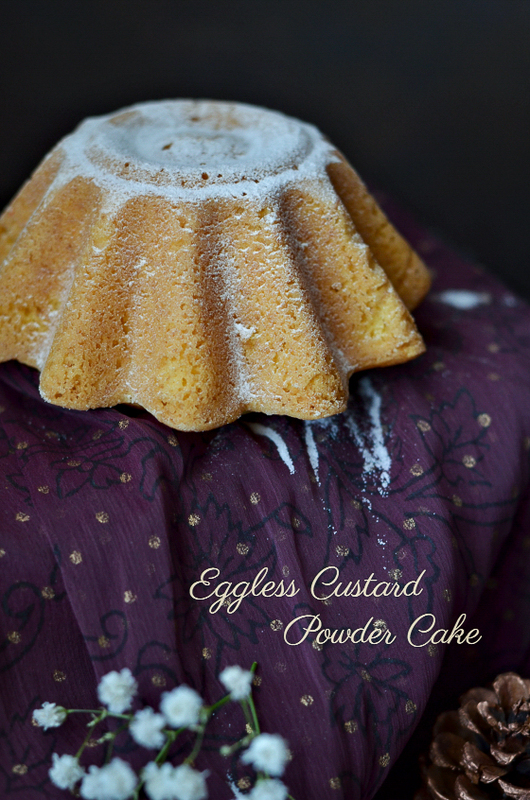 Custard has a very pleasing flavour and a cake with it sounds super delicious , the texture of the cake looks fantastic ! Those mini bundt cakes are amazing!! Custard powder will make the cake taste great. Wow nalini, it is so good to see your food pics!!! the texture of that cake is amazing! Cake looks fabulous!!! 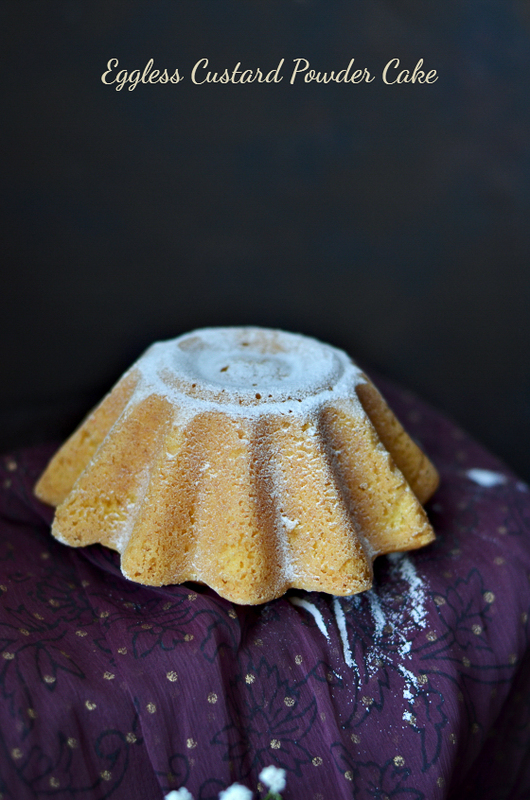 The bundt cake looks so cute, light and spongy.Like the addition custard powder into the cake. The cake has beautiful texture, nice spongy cake with beautiful look. Though a simple basic version cake, you have made it look special through your camera lens. Such a delicious n beautiful bake. Love it. Such a beautiful click! I too made this long back but mine dint look so good! Love that you baked it in a mini bundt pan.